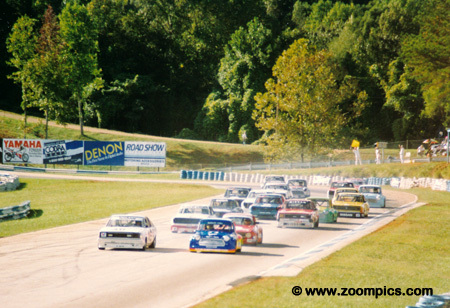 The 1990 edition of the Runoffs took place at Road Atlanta – the twenty-first time the National Championships were held at this track. Taking place over the week of October 8 - 14 the event had over 550-entries competing for 22-National titles. A tropical storm from the south had a significant impact on the event. In the case of some classes, there was only one dry qualifying session. However, the weather improved for the races on Friday through to Sunday. The GT5 class lines up in anticipation of receiving the green flag. On the front row is Jeffrey Werth in a Nissan 210 and beside him the Fortech Mini of Travis Duder. Werth led lap-9 which won him the mid-race bonus but he was not out front for the most important lap. All but three of the nineteen-starters would receive the checkered flag. 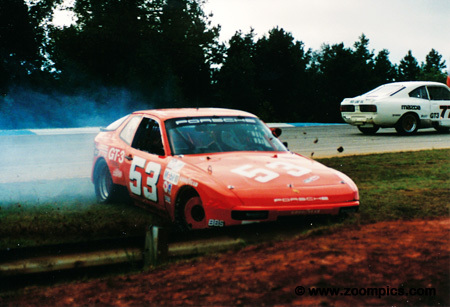 On the final lap of the GT3 race, Don Meluzio spun his Porsche 924 in turn one. In the background is Bruce MacArthur in the No. 77 Mazda RX-3 - he inherited sixth place as the result of Meluzio’s misfortune. Meluzio would be classified in fifteenth place after starting tenth. 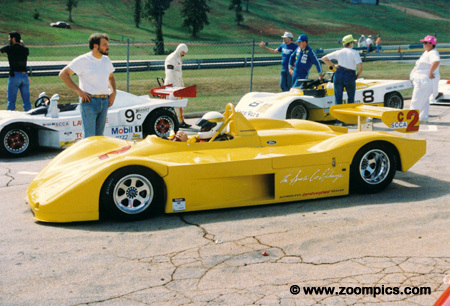 Tom Schweitz qualified his Sports 2000 Lola T-88/90 second. At the start he jumped into the lead heading up the turn one hill into corner two. However, his first place position was short lived as pole sitter Jay Hill tapped him from behind. The resulting spin at turn eleven knocked the nose off the Schweitz Lola. Hill would capture the National S2000 crown while Schweitz would finish tenth. 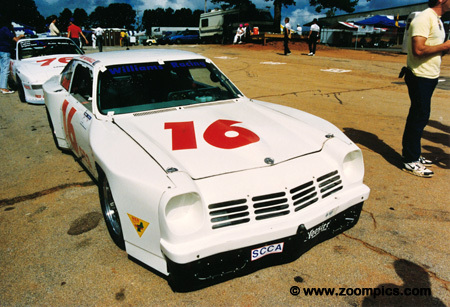 This Chevrolet Cosworth Vega competed in GT3 and was driven by Robert Quindazzi. These cars were produced in 1975 and 1976 but production was limited to 3,508-cars and it is reputed to have a list price of $900 less than that of a Corvette. They were powered by a 2-liter 4-cylinder DOHC engine. Quindazzi qualified eighth but did not finish. In 1989, he led the race for 3-laps. Another year and another new paint design for Larry Moulton. Moulton changed colour scheme of his F Production Turner on annual basis always making it easy to spot. Turner sports cars were produced between 1951 and 1966. The F Production version, Turner Sports MK II was powered by a 1500-cc Ford engine. In 1990, he started on the pole and finished third. 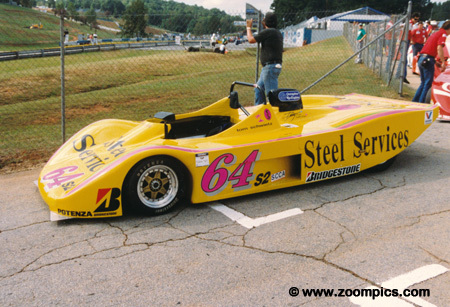 Robert Schneider raced this beautiful C Sports Racing Lola RT-C. Schneider qualified second to 1983 National Champion Chuck Billington in the Tracer Racing Tracer TR-2. Although he would drop back to fourth at the start, Schneider would finish second - 26.25-seconds behind Billington. 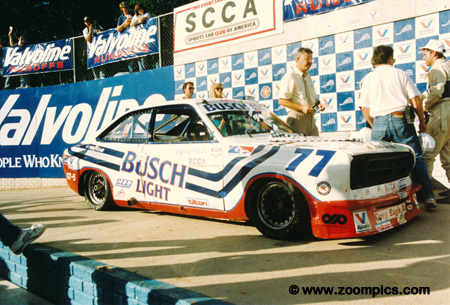 In addition to his 1983 title Billington would win the C Sports Racing National title from 1990-93 and again in 1997. Despite this damage Eric Van Cleef finished third in GT4. Van Cleef qualified second in his Toyota Corolla but on the third lap he and pole-sitter Don Erb in a Honda CRX came together in turn one. Erb hit the rear of Van Cleef and rolled the Honda. On his way to third place, Van Cleef put on a charge that included two spins and a black flag pit stop. Richard Grant succeeded in missing a major on track incident to win the GT4 National title in his Datsun B210. He qualified third but an accident between the two front runners – Don Erb and Eric Van Cleef allowed him to inherit the lead on lap-8. Despite threats from Van Cleef and David Windle in a Datsun 510, he was first to the checkered flag. Not yet a National class the Shelby Can Am cars competed in a 12-lap demonstration race. The Shelby Can Am used a space frame chassis designed by David Bruns – best known for creating Swift race races. The body was penned by Pete Brock. The car was powered by a Dodge 3.3-liter V6 which produced 225-horsepower. Bob Lobenberg started on the pole and won the inaugural race. Three-time G Production National Champion Tom Mankin spins his Alfa Romeo Giulietta in turn five. Mankin suffered brake problems during the week but managed to qualify seventh in F Production. His race went from bad to worse as he finished twelfth. Jeff Clinton led only 1-lap but it was the most important one during the GT5 race. 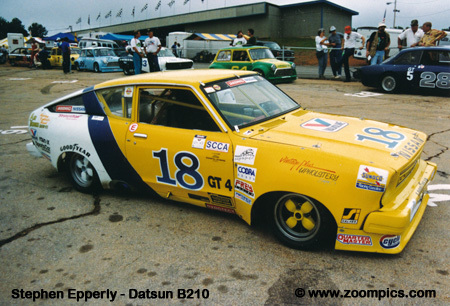 Clinton’s Datsun 1200 was a Don Preston tube frame chassis which he qualified third. He chased Jeffrey Werth but was not able to pass until Werth was slowed by a back-marker. Clinton’s margin of victory was 0.98-seconds. On the final lap of Showroom Stock C Pete Peterson in the No. 86 Toyota MR2 and the No. 43 Honda Civic of Cory Markos made contact – they were contesting sixth place. Markos who had started sixteenth would finish seventh after the incident. Peterson did not fare as well – he would be classified in sixteenth. Last year’s runner-up in GT3, John Hagenbush, qualified on the pole for the 1990 event. 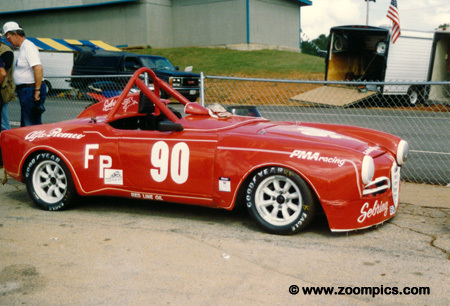 The Acura Integra was passed by Fletcher William’s Triumph TR6 at the start. 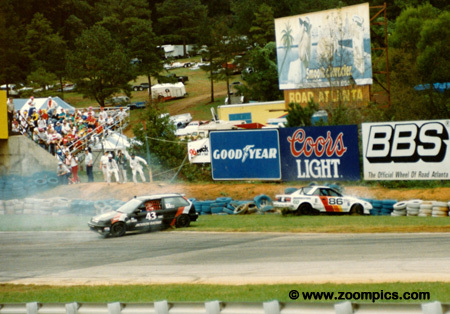 In the end, Hagenbush finished fourth his car lacked the speed required for Road Atlanta’s long back straight. 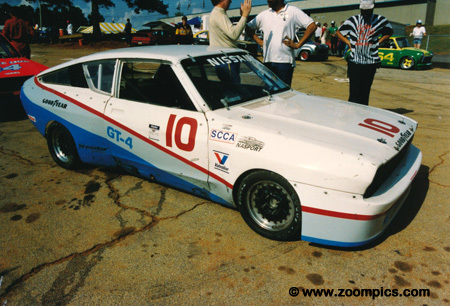 The GT3 National Championship was won by Don Walker in a Mazda RX-3. Al Leake, Jr. won the 1990 Northern Pacific G and F Production championship. 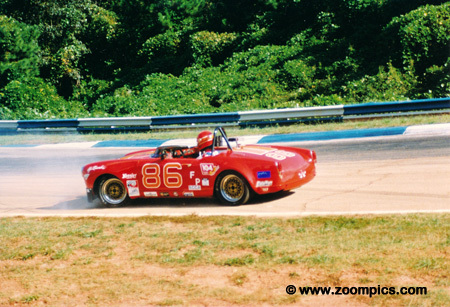 As a result, he competed in both classes at The Runoffs – in one car – an Alfa Romeo Spider. His first race was G Production where he qualified thirteenth and finished seventh. In the F Production race Leake started fifteenth but problems required a pit-stop which left him with a sixteenth place finish. Travis Duder qualified second and finished third in GT5. 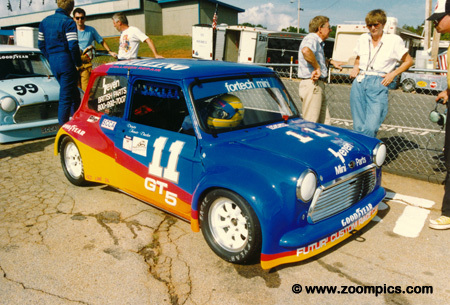 He was selected to race the Fortech Mini when regular driver Doug Peterson could not commit to the 1990 season. 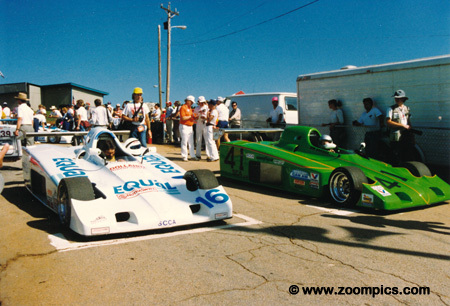 Peterson’s Comptech company was responsible for Acuras involvement in the IMSA series. 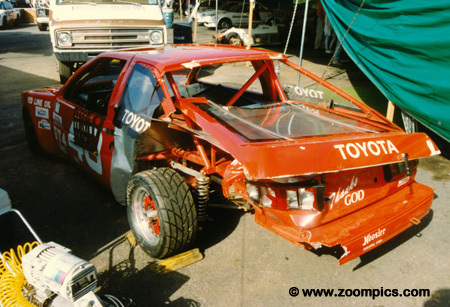 An early season crash by the car’s owner resulted in Duder driving the car once before the Runoffs. Turn one and the start of the Showroom Stock GT race. Fred Baker in the No. 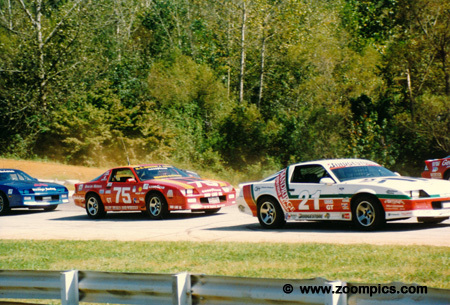 21 Chevrolet Camaro is followed by Tom Lynch also in a Camaro. Baker started seventh and ran as high as third but was fourth at the checker. Unfortunately, he was excluded from the results due to a technical infraction. Lynch who qualified tenth finished fifth. The race was won by Boris Said. 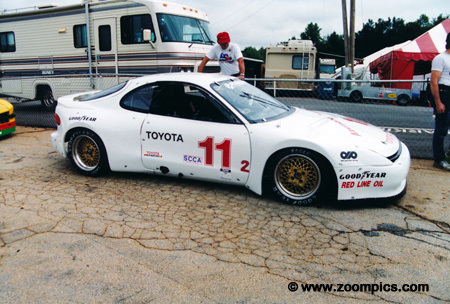 Duane Davis was entered in the ex-John Kelly Toyota Celica. The car was a tube frame chassis constructed by Don Preston. 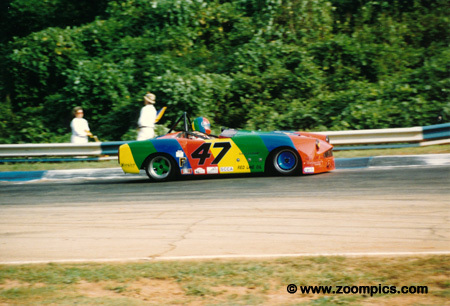 Kelly finished second in GT2 at the 1988 Runoffs. During the week, Davis had a series of problems which left him with a seventh place starting position. However, it all came together for the race and he finished second just 0.152-seconds behind Matt Mnich. The No. 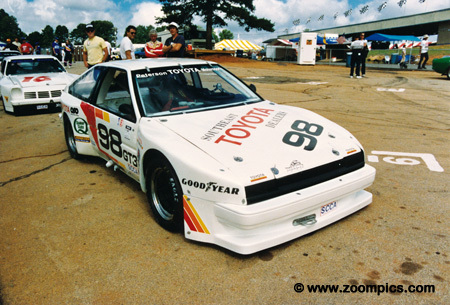 98 Toyota Corolla GTS on Pete Peterson qualified fifth in GT3. Peterson was able to pass the cars that qualified ahead of him. However, he was passed by eventual winner Don Walker, who started sixth. In 1991, he would he would lead all laps and win his first National title.